¬¬¬¬There has been a good deal of concern lately about a material called CSST. The letters stand for Corrugated Stainless Steel Tubing. The name accurately describes what it is, but its use for natural gas (or propane) lines in your home may not be so obvious. Gas is traditionally piped through the house with ‘black pipe.’ This is a steel pipe that is not galvanized and must be threaded to accommodate junctions and elbows. The threading is an arduous time consuming process done on the job site. CSST was developed to be flexible and can be run to appliances throughout the house without multiple threaded junctions. Ends are terminated with suitable threaded connectors that are easily installed. The product greatly simplifies gas plumbing in new homes. The ‘danger’ occurs when lightning energizes a CSST line and arcs to an adjacent grounded metal surface. The arc readily punctures the thin walls of the CSST and ignites the gas now leaking out of the puncture. Bear in mind that direct lightning strikes can severely damage a home with or without CSST. Certain geographical areas of the US are more prone to lightning storms, and seasonal prevalence of lightning varies across the country. 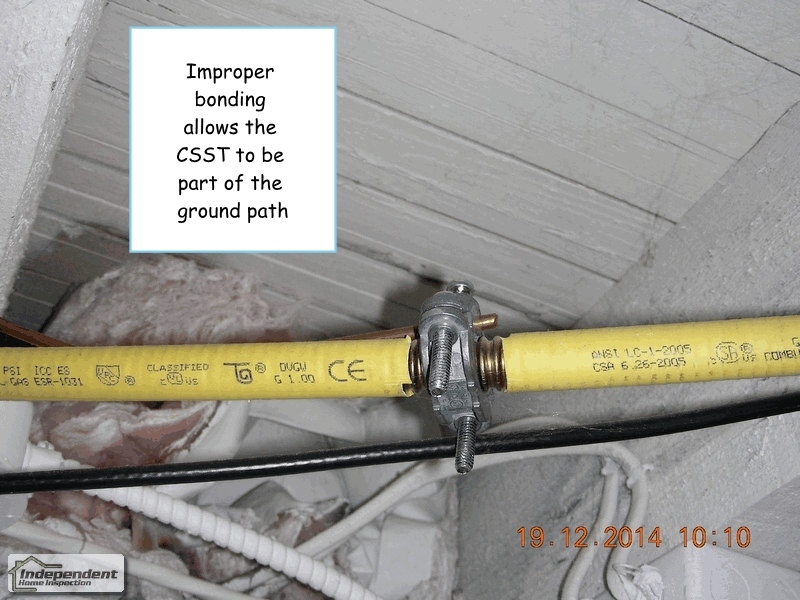 Proper installation of CSST requires ‘bonding’ (create an electrical path) the CSST to the homes electrical ground. The intended purpose of bonding is to prevent the CSST from becoming the lightnings electrical path by diverting the energy to ground. Maryland law requires a statement in a home inspection report to suggest that only a licensed Master Electrician can verify a properly bonded CSST system. While this is certainly good advice, it bears mentioning that proven fires caused by CSST represent a fraction of one percent of all the current installations. To date no class action lawsuits against CSST manufacturers have been successful in proving their case. One reputable law firm on the internet advises that, “Since August 2011, it has been reported that at least 140 fires involving lightning and CSST have occurred across the United States.” Continued reading on this site reveals that there are more than six million homes across the United States that are equipped with CSST. You do the math. There is no question that CSST should be properly installed and bonded, but don’t let its presence scare you away from a perfectly good home.